Blood pressure medications come in different forms and each is intended to cause a different reaction in the blood or blood vessels. An ace inhibitor is one such medication used in the treatment of hypertension. Angiotensin Converting Enzyme (ACE) inhibitors prevent the manufacture of a hormone in the body called angiotensin II. Angiotensin II makes blood vessels narrower. When the hormone production is blocked, the arteries remain wider and allow blood to flow through with less pressure on the vessels, thereby lowering blood pressure. Benazepril, Enalapril and Lisinopril are three ACE inhibitors commonly used in the treatment of high blood pressure. They are seldom the first course of action but are used to treat the more severe cases of hypertension. Ideally, maintaining a proper weight and eating right are the best ways to control blood pressure. After that a diuretic type of medication may be prescribed, which works based on the idea of flushing the arteries so pressure is reduced. The brand names under which the common ACE inhibitors used to treat high blood pressure are sold are Lotensin (benazepril), Vasotec (enalapril) and Prinivil and Zestril (lisinopril). All of these work to increase blood flow by keeping the arteries open and wide. ACE inhibitors have side effects just like any other drugs. It can feel as if you have a bad cold because many of the symptoms that are possible are a cough, sore throat, fever, and mouth sores. Other symptoms include an itchy, red skin rash, swelling of the neck, face or tongue, or a salty or metallic taste in your mouth. While all of these are not extremely common, they have been reported in enough cases to be listed as possible side effects to taking ACE inhibitors. One side effect is raised potassium levels. Some medications, such as diuretics, actually reduce potassium and that has some health risks with it as well. The opposite is true of ACE inhibitors. Because they can raise potassium levels it is important to have yours monitored if you are taking any of these prescriptions. Symptoms of too much potassium in the blood stream include nervousness, a numbness or tingling feeling in the hands or feet, and even confusion. There can also be difficulty breathing. It is important to watch what you eat and what you do while taking ACE inhibitors. Some foods which contain potassium, such as salt substitutes can cause you to have dangerously high levels of potassium. Also, taking anti-inflammatory drugs such as Advil, Motrin, Aleve or aspirin can negate the effects of your ACE inhibitor drug. The challenge in controlling blood pressure with medicine is two-fold. Medical professionals will try the least invasive type of drug, meaning one with the least chance of side effects and that requires the lowest dose possible to manage your blood pressure. This means that a patient can often go through years of trial and error type of drug experimentation before finding something that works. Meanwhile, blood pressure can be going untreated. 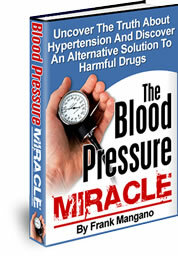 Secondly, medications to treat blood pressure have side effects – all of them to some degree. You may find that using them requires you to take other medications to treat the symptoms of the side effects. As with any disease or condition, a natural approach can be just as effective, without the risk of side effects. A doctor can help you determine if you need to lose weight or make other changes to control your blood pressure.